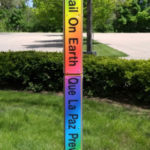 The Peace Pole at Central Woodward Christian Church, an Open & Affirming congregation in Troy, MI. This workshop will provide in-depth and hands on training in the tools of Graceful Engagement, One to One Conversations, Storytelling, Framing, and more. These tools are also powerfully useful in many other contexts. Our friends at Reconciling Works, Lutherans for Full Participation, will lead this workshop. Building an Inclusive Church trainings are for leaders in congregations which are considering becoming Open & Affirming and for those who would like to know more about supporting other congregations becoming O&A. This training will hone your skills and give you knowledge about how to help congregations through those necessary conversations toward a fully inclusive church. Here’s a flyer with more information – and you can use this flyer to help us spread the word!